Current Status of Lawsuit: The Beacon Center won in Circuit Court, with the judge ruling that Metro Nashville’s law was too vague, which invalidated the law. The city has appealed the ruling, and the case is now pending a hearing on that appeal. P.J. 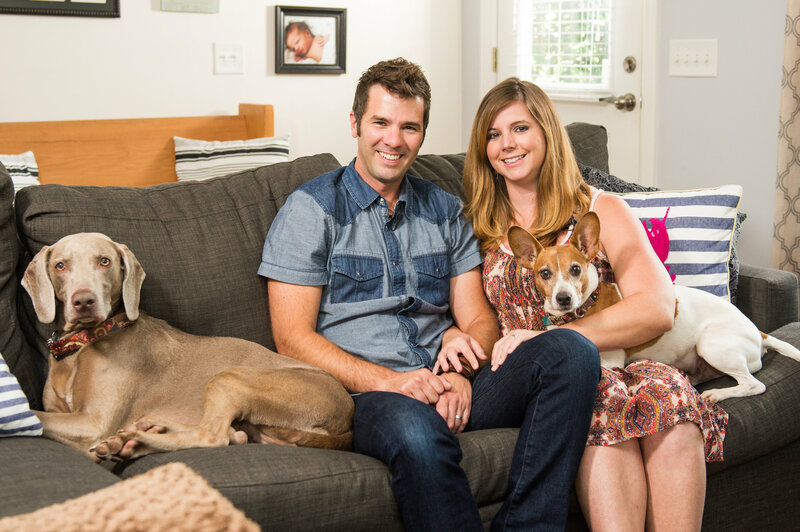 and Rachel Anderson are a young couple with two children living in Germantown, a growing neighborhood just north of downtown Nashville. He’s a professional Christian singer-songwriter who is often on the road. She’s a graphic designer, and since she can work from virtually anywhere, Rachel and the kids try to travel with P.J. as often as they can. While they travel, P.J. and Rachel use a service called Airbnb as a means to supplement their income. It’s changed everything for their family. Airbnb is a website for people to list, discover, and book homes and apartments in other cities. An alternative to traditional hotels, Airbnb is often cheaper and typically offers a more unique experience, such as staying in a residential neighborhood, having more space including a kitchen for cooking, etc. Airbnb has been massively successful, especially in Nashville, where it has introduced countless tourists to the city, addressed an often-cited hotel shortage that has been used to justify millions of dollars in taxpayer subsidies, and supplemented the incomes of thousands of middle-class entrepreneurs. Airbnb is exactly like Uber. People want it, except for special interests that have to compete. That’s why the taxi industry tried to regulate Uber out of existence, and that’s why the hotel conglomerates support stringent regulations on Airbnb. P.J. and Rachel’s case is about preserving the ability of middle-class families to use their property in a way that helps them provide for their family and their future. By renting their otherwise vacant home on Airbnb when they are out of town, P.J. and Rachel don’t have to worry about how to pay their mortgage each month. They can save and invest in their family’s future. Airbnb means financial peace. Or it did. Due to family and career decisions, P.J. and Rachel may soon have to move their family, but they love Nashville, their house, and they want to keep it. When P.J. and Rachel looked into moving, Nashville suddenly denied them a permit to continue operating their home on Airbnb. They don’t want to sell the home they love. They hope to return to it some day, but they need to continue to earn a small side income to supplement their sometimes sporadic income from their regular jobs in order to keep the home in their family. Yet, P.J. and Rachel have been denied this opportunity because there are no more non-owner occupied permits available for their Germantown neighborhood. This isn’t fair. They listed their home on Airbnb for more than a year. Out of 40 reviews, they have a five-star rating and overwhelmingly positive comments. Just because several of their neighbors are also on Airbnb, it shouldn’t limit Andersons’ ability to use their home as they see fit. The reason that P.J. and Rachel can’t obtain a permit is because, effective July 2015, Nashville passed an ordinance that directly impacts Airbnb-ers like them. This poorly crafted ordinance requires a permit and unnecessarily infringes on P.J. and Rachel’s constitutional rights. Because of an arbitrary 3% cap on the number of non-owner occupied permits available, P.J. and Rachel were not able to get the permit they need to keep their current home as a valuable source of revenue when they move. The few permits available for their neighborhood—just 28 of them—have been claimed. P.J. and Rachel now have to make important family decisions based on the expectation that they cannot maximize their home’s value when they move. This new ordinance is oppressive and unfair. Airbnb is a positive addition to Nashville, a city that currently allocates millions of taxpayer dollars to attract hotels because of a perceived shortage in bed space. Airbnb helps Nashvillians too. 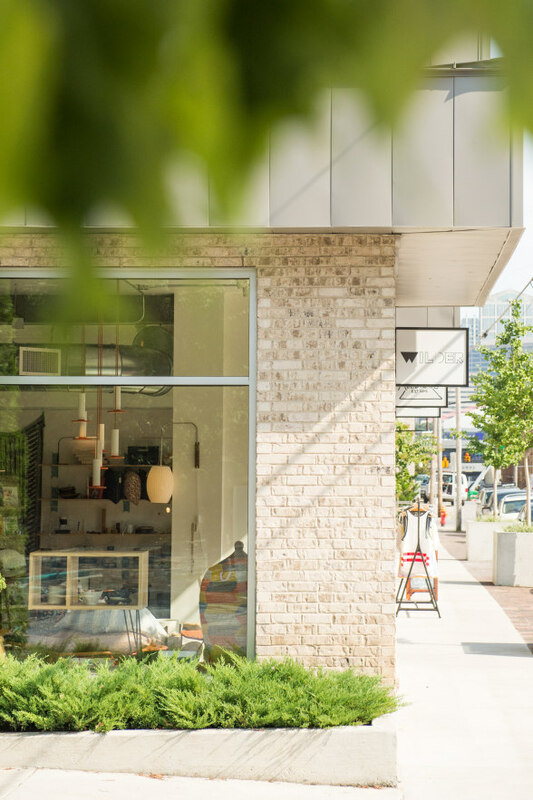 Like many Nashvillians, especially those who live in areas close to restaurants, bars, sports stadiums, and other attractions, the rules of the game have suddenly changed. As a result, P.J. and Rachel—and many like them—have lost the financial ability to better support their young family. The sharing economy has made entrepreneurs out of a whole new generation. Companies like Uber have experienced rapid success because of their convenience and affordability. But with that success comes attacks from established interests. Airbnb users currently face such a challenge. The hotel industry has looked at Airbnb’s success and correctly perceived it as serious competition and a threat to its bottom line. Just as taxi companies responded by pushing for onerous regulations against Uber rather than engaging in honest competition, hotels are eager to make it more difficult for Airbnb to thrive. But why should big hotel chains from outside Tennessee make millions off tourists (and taxpayers via handouts and tax breaks), while P.J. and Rachel are banned from making a little extra income by opening their home to those same tourists? Unfortunately, cities are all too eager to accommodate the hotels to the detriment of everyday residents. Even before the ordinance, Airbnb was a win-win for the city. 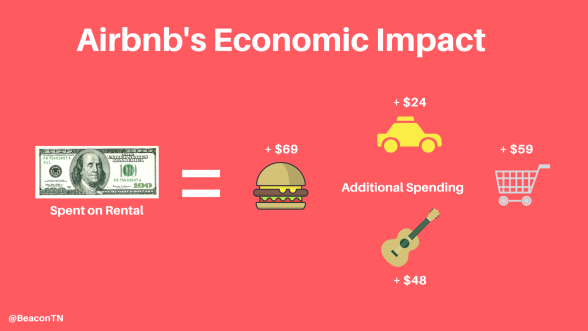 For Airbnb-ers, it is a great way to get a little financial cushion, as well as the thrill of participating in a growing business model. For the city, Airbnb has attracted tourists from all over who want to experience Nashville like the locals do. Those tourists bring their dollars and spread them around. A study in Chicago found that for every $100 spent on a short-term rental, another $69 went to food, $24 to transportation, $59 to shopping, and $48 to entertainment. Not only that, Airbnb addresses the much-cited hotel shortage, a problem so dire that Nashville literally allocates millions of taxpayer dollars to remedy it. The recently constructed downtown Omni Hotel alone is estimated to cost Nashville taxpayers more than $125 million over the next 20 years. 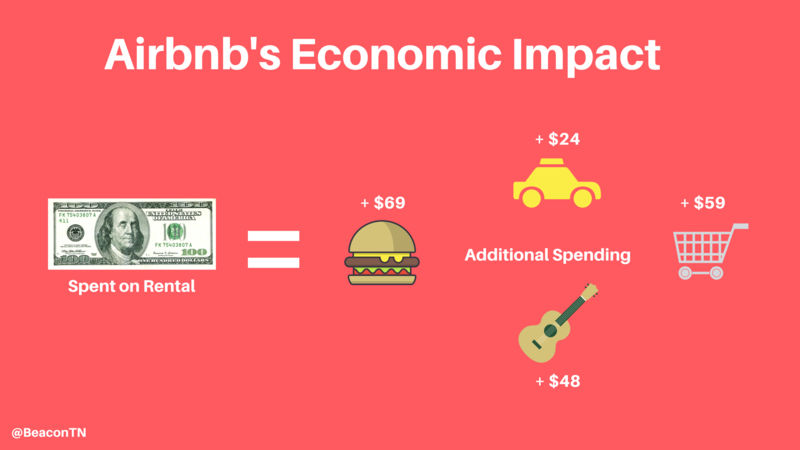 Airbnb is not only free, it generates both tax dollars and tourism dollars. Nashville should do everything it can to encourage the growth of Airbnb in neighborhoods like the one where P.J. and Rachel live, not discouraging it with hastily crafted and burdensome regulations. Also troubling is what Nashville intends to do with the money the ordinance generates. Rather than save it or pay down existing debt, city leaders recently passed a bill that would designate tax proceeds from Airbnb rentals to the so-called Barnes Fund for Affordable Housing. While affordable housing is a worthy goal, the fund actually just offers taxpayer incentives to real estate developers ostensibly to build “affordable housing.” Effectively this means that Nashville will take money from vulnerable, middle-class families like the Andersons and transfer it to wealthy real estate developers. P.J. and Rachel currently have a permit to operate Airbnb out of their house. When they move, however, they will lose that right. This is because Nashville differentiates between owner and non-owner occupied homes even though both have the same impact on a residential area. Nashville has capped the number of non-owner occupied permits (aka, those who don’t live in the home full time) available in a particular neighborhood, but not the number of permits overall. This matters to P.J. and Rachel. As their family grows and job opportunities in other cities arise, they would like to buy a new house and keep their current one to list on Airbnb. But they cannot. Not only are no more non-owner occupied permits available, nothing in the law forbids current permit holders from holding them forever, effectively creating a government-sponsored monopoly that denies P.J. and Rachel the full use and value of their home. Fears of how Airbnb disrupts traditional neighborhoods are the usual justification for regulations like these. However, in this case, those fears are unfounded, especially since Nashville (unlike some cities) has made the decision to permit Airbnb outright. 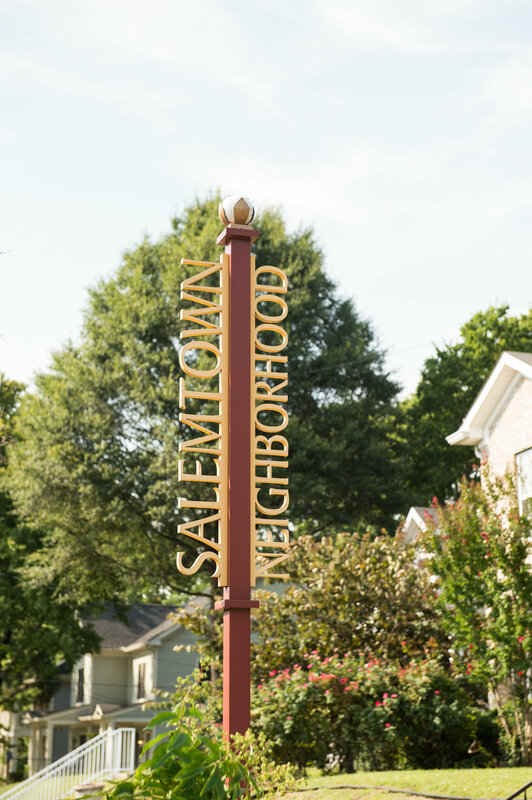 There are numerous reasons that the character of Nashville’s neighborhoods will not be negatively impacted by Airbnb. 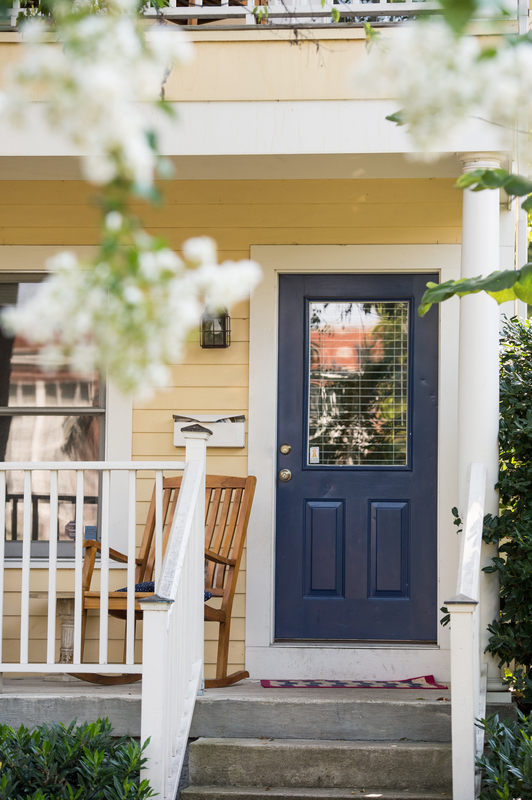 Existing zoning, noise, and other restrictions can effectively curb the growth and harm of short-term rentals in more traditional, single-family residential neighborhoods. This case does not challenge any of these regulations; they will continue to protect the character of neighborhoods and protect neighbors’ quiet enjoyment of their property. Airbnb is also self-policing. First, hosts are incentivized to maintain their property both inside and out. 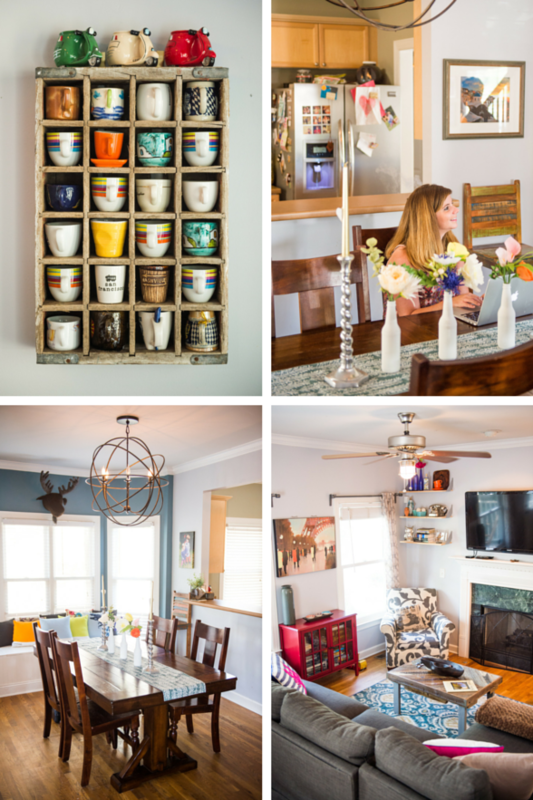 When you have guests coming over, do you trash your house or clean it up? Second, the rating system for both hosts and guests encourages hosts to maintain a clean environment and guests to be respectful of both the home and neighborhood. P.J. and Rachel are among the many Nashvillians who are paying the price of this ill-conceived ordinance. Their online reviews have been overwhelmingly positive. In fact, for all the expressed concern about Airbnb’s impact on residential communities, Nashville has heard very little in the way of actual complaints and none against the Andersons themselves. Demand will also ensure that quieter, more residential neighborhoods will be minimally impacted if at all. For example, the Andersons’ community is different from other residential neighborhoods precisely because it is more walk-able, and is so close to restaurants, coffeehouses, shops, etc. This is the type of thing renters are looking for in an Airbnb home. Renters are seeking to stay in areas like Germantown, 12th South, and East Nashville, rather than strictly residential areas like Belle Meade and Forest Hills. If Nashville’s government wants to enact regulations, they need to be smart ones, tailored to fit Airbnb hosts like the Andersons and their renters. The Beacon Center has the following goals in mind: 1) Nashville should craft an ordinance that is clear and understandable; 2) Nashville needs to treat all people the same instead of picking winners and losers; and 3) Nashville needs to avoid burdening property and free speech rights any more than is absolutely necessary. P.J. and Rachel want fairness. They want to provide for their family, maintain their Nashville roots, and have an equal opportunity to succeed. This case will give them the fairness they deserve. 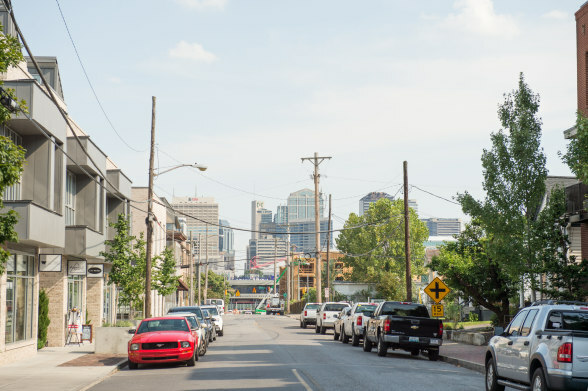 Nashville’s permit law picks winners and losers in the marketplace. In denying P.J. and Rachel the ability to participate in commerce just like their neighbors, the 3% cap violates the Andersons’ equal protection rights and constitutional protections against monopolies. Furthermore, the Andersons also have a substantive due process right against having a permitted action—the rental of their home—made contingent on the actions of others. The city has no interest that is rationally advanced by capping the number of non-owner occupied permits when an unlimited number of total permits are available. P.J. and Rachel also have a constitutional right against vague laws. The ordinance has serious vagueness problems that no reasonable person could resolve. For example, hotels are exempted from the ordinance. Yet, what is technically a hotel is extremely confusing. Are P.J. and Rachel running a hotel or aren’t they? The way the ordinance is written, no one could know. Even worse, the ordinance unnecessarily goes out of its way to impact free speech. P.J. and Rachel, like all Americans, are entitled to vigorous First Amendment rights to speak as they see fit, and even advertise a lawful business. Although diminished in the commercial setting, commercial speech—like advertising—is a constitutional right. Yet P.J. and Rachel, who have a lawful permit, are unequivocally forbidden from placing even a temporary and modest sign identifying that their property is available on Airbnb. Other similar signs are permitted, including signs advertising yard sales or traditional for rent signs. While Nashville can place reasonable regulations on these types of signs, it cannot treat speech about Airbnb any differently. Finally, the Fourth Amendment protects people from unreasonable searches. Just recently, the U.S. Supreme Court sweepingly rejected the notion that Los Angeles may require hotels to keep records on their guests and provide them to the police any time they ask, even without a warrant. Nashville has a similar law that would appear to include Airbnb hosts. Although police have never knocked on the Andersons’ door, the courts should eliminate this unconstitutional requirement before that day comes. The plaintiffs in this case are P.J. and Rachel Anderson. The defendant is the Metropolitan Government of Nashville and Davidson County. This case has been filed in the Circuit Court of Davidson County. The Andersons seek a ruling that Nashville must cease enforcement of the arbitrary cap, the bans on advertising and signage, and the records requirement. The Andersons also seek an order declaring the Airbnb ordinance unconstitutional and the records keeping ordinance unconstitutional. Braden Boucek is the Director of Litigation for the Beacon Center. Prior to joining the Beacon Center, he worked as an Assistant United States Attorney, and before that for the State of Tennessee as a trial and appellate prosecutor. Justin Owen is the president and CEO of the Beacon Center and is licensed to practice law in Tennessee. Ellen Margulies, “Airbnb, Other In-Home Vacation Rentals Face Rules, Taxes.” Memphis Daily News. Oct. 4, 2014. http://www.memphisdailynews.com/news/2014/oct/4/airbnb-other-in-home-vacation-rentals-face-rules-taxes/ (last viewed Aug. 11, 2015). Matt Batcheldor, “Why Music City Center is losing out.” Nashville Business Journal. Jan. 24, 2014. http://www.bizjournals.com/nashville/print-edition/2014/01/24/why-music-city-center-is-losing-out.html (last viewed on July 21, 2015); Joey Garrison, “Council signs off on Omni Hotel financing.” The Nashville City Paper. Oct. 19, 2010. http://nashvillecitypaper.com/content/city-news/council-signs-omni-hotel-financing (last visited on July 21, 2015). Joey Garrison, “Cost increases for proposed convention center hotel.” The Nashville City Paper. Sept. 30, 2010. http://nashvillecitypaper.com/content/city-news/cost-increases-proposed-convention-center-hotel (last viewed on July 21, 2015). Joey Garrison, “Plan to boost housing fund with Airbnb tax revenue advances.” The Tennessean. Apr. 7, 2015. http://www.tennessean.com/story/news/politics/2015/04/07/plan-boost-housing-fund-airbnb-tax-revenue-advances/25443033/ (last viewed on July 15, 2015).